Detectives are appealing for information following a cash-in-transit robbery at a Padiham bank. Around 7-50 pm yesterday (January 13th), two security guards were filling the cash machine at Santander in Burnley Road when they were approached by three men wearing balaclavas. Demands have been made of the security guards which have enabled the men to make off in possession of the container making off down the side of the bank. No weapons or violence have been used. Police said the men are then believed to have left the area in a silver Ford Mondeo. Following enquiries police later found a white Ford Transit van on Mill Street, which the offenders are believed to have travelled to the area in. Detectives are appealing for anyone with information about the raid, or either vehicle, to contact police immediately. Det Sgt Allen Davies, of Burnley CID, said: “We have launched an investigation following a cash-in-transit robbery in Padiham. Three men have approached security guards demanding cash before making off from the scene. “While no weapons were used or threats made, this was clearly a shocking incident for both victims and we need to find those responsible. 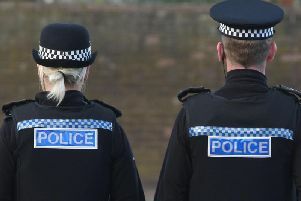 “We believe the men may have travelled to the area in a white van, which was later located on Mill Street, before later making off in a silver Mondeo. “We are appealing to anyone who saw either vehicle, or witnessed the offence, to contact us. Furthermore, if you saw anything unusual or anyone acting suspiciously around the time of the offence, please call police. Anyone with information can contact police on 101 quoting log reference 1253 of January 13.